Teddy Westbrook Tate, 86, of Kountze, died Friday, February 1, 2019. He was born on June 13, 1932, in Colmesneil, to Jessie Elizabeth Westbrook and Dr. Robert Alexander Tate. Tate’s passion for sports led him to the opportunity of putting Kountze on the map. One evening after several days of scouting, the fast throwing pitcher who was striking all the kids out, Tate felt ready on that third day. Stepping into the box, he took the first pitch. Knowing what was coming next, he was ready. A swing and over the fence the ball went. All the boys cheered, putting Tate on their shoulders, carrying him around the bases. The next day at school they asked Tate where he was from, he proudly went to the map on the board and pointed to Kountze, Texas. Tate went on to excel in Baseball, playing catcher for the University of Texas form 1950-1952, and went on to a successful career in Pro Ball starring for the Beaumont Exporters in the 50’s. In 1962, the Kountze legend began. 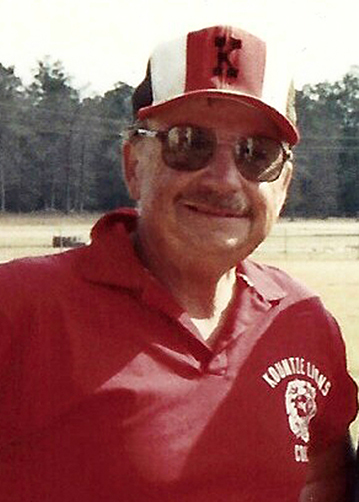 Coach Tate sported a career record 502-258-5. In Varsity Athletics, to our knowledge, Coach Tate is the only coach to reach the State Semi Finals in three different sports as Head Coach: Football, Baseball, and Basketball securing his position of being Kountze’s all-time winningest Coach and one of the best to coach the games! Survivors include his wife, Billie Tate; children, Tatia Tate, of Lumberton; Tanda Tate-Pruitt and her husband, Geary, of Kirbyville; and Tray Tate, of Kountze; and grandchildren, Taryl Coco and her husband, Chad, of Sour Lake; Sydney Marceaux, of Houston; Cara LaForge and Tate LaForge, both of Beaumont; and Sterling Tate, of Kountze; and numerous nieces and nephews. Tate is preceded in death by his parents; brother, Dr. John Tate; and sisters, Dr. Eugenia Gauntt and Aline Williford. A gathering of Mr. Tate’s family and friends will be from 5:00 p.m. until 8:00 p.m., Saturday, February 9, 2019, at Broussard’s, 530 West Monroe, Kountze. A private family committal was held at Broussard’s Crematorium, Beaumont. The family would like to thank the team of nurses from Best Care Hospice for the excellent level of care shown to Coach Tate and a special thanks to Caroline Blending and Sarah. In lieu of flowers, memorial contributions may be made to Kountze Public Library, 800 South Redwood Avenue, Kountze 77625 and to the Kountze Booster Club, P.O. Box 460, Kountze, Texas 77625. My thoughts and prayers are with the family. I will always remember my first years at Kountze high school. It was great to know Ted and Billie Jean. Take care and know Ted will be missed. I have admired & loved this man my whole life. I grew up knowing him & the Tate family. We were neighbors on Williford Road in Kountze., 52 years ago. I have wonderful memories of Coach Tate. During my High School years,. Coach Tate ( knowing that I was a horrible player) put me on the girl's basketball team. i desperately wanted to be a good basketball player.. He worked my tail off during practice & was so patience with me. He would probably say I was the worst player he had ever had.. But he never gave up & to this day, I remember those practices. Latter, he was my driver's ed teacher.. I still remember specific driving skills he taught. Coach Tate gave all of his students 100 percent, we all respected & loved him. Praying for all of the family & friends. God Bless You. Why I remember this, I do not know. Coach Tate entered the Jr. High basketball team in a tournament. I was on the team. We were not playing so well but I made a buzzer beating shot that won the game. Coach Tate was not pleased with our performance so he forfeited the rest of the games and we came home.. I think he had a golf game he didn't want to miss. So many great memories. .He was my baseball coach from Jr High thru High School (1966). His love of the sport carried over to practice and games often ending in victories and as only he could do - controversy for opponents.. Many lessons carried over to "the Game of Life". Thank You and Well Done Coach Tate. Coach Tate will always be in our KHS class of 1968 memories and so blessed that he could be with us at our reunion last May. And yes he taught me to drive also. Think of him so many times during the years. Thank you Coach Tate for all you did for us students. He taught me to drive my Freshman year. His presence on and off the field as left a lasting legacy. Prayers for his friends, family and many students. In May I had the opportunity to call him and invite him to our 50th class reunion. He was so excited and gladly accepted. Is was truly one of the highlights of our reunion. He had a terrific memory and could quote statistics from many years ago. Thanks Coach Tate. Ms Tate we love you and we are praying for you.